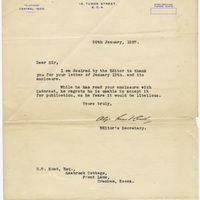 Consists of a letter rejecting Herbert Hunt's essay "Empire Settlement Canada" for publication in The Morning Post. 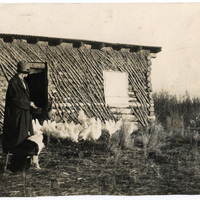 Consists of a photograph of Jessica Hunt with a dog and chickens at Hedgerows. 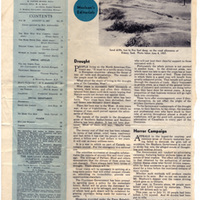 Consists of a page from Maclean's Magazine from 1937 with an editorial about the impact that prolonged drought had on farmers in western Canada. 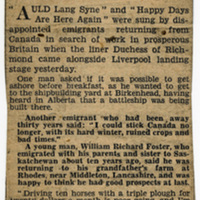 Consists of a newspaper clipping kept by Herbert Hunt that details the joyous return of former 3,000 Family Scheme participants to England. 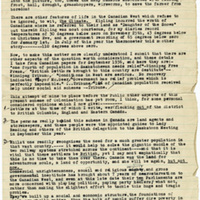 Consists of an essay written by Herbert Hunt after his return to England in which he reflects on his experiences farming in Saskatchewan. In a marked contrast to his earlier published work, Hunt criticizes the 3,000 Family Settlement scheme. 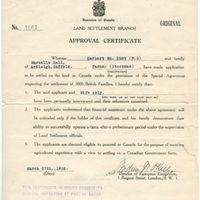 Consists of instructions for participants in the 3,000 Family Settlement Scheme by the Department of Immigration and Colonization, as they prepare for relocation to Canada. 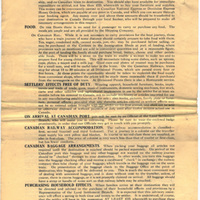 Consists of a wheat contract between Herbert Hunt and the Saskatchewan Wheat Producers Limited. 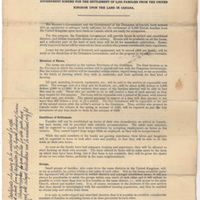 The agreement stipulates the responsibilities of growing wheat in Saskatchewan, the crop which was Hunt's primary output. 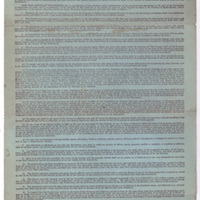 Consists of Herbert and Jessica Hunt's certificate of approval for participation in the 3,000 Family Scheme, containing further directions and conditions. 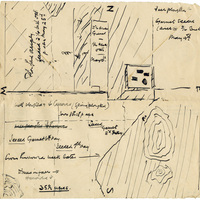 Consists of a hand-drawn map depicting ploughing and seeding activities at Hedgerows farm, created by Herbert Hunt on the interior of an envelope. 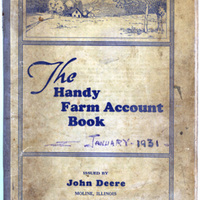 Consists of a diary titled "The Handy Farm Account Book: January 1931," kept by Herbert Hunt during that year. 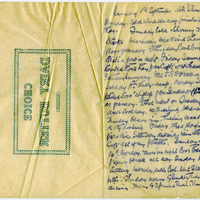 The diary contains a record of Hunt's assets and his observations of daily life on the farm. 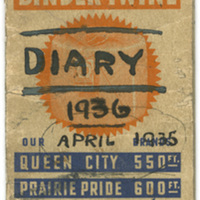 Consists of diary entries by Herbert Hunt during his second year of farming, recorded on repurposed paper.